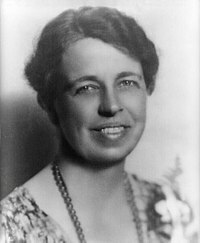 Anna Eleanor Roosevelt (October 11, 1884 – November 7, 1962) was a social activist, and the wife of US President Franklin Delano Roosevelt. She was the First Lady of the United States from 1933 to 1945. Simple: Nobody can make you feel as if you are not as good as other people, unless you let them. What it means: It is your choice whether to allow other people to make you feel bad at what you do. ↑ Free, Fearless, Female: Wild Thoughts on Womanhood. Willow Creek Press, 2004. Minocqua, Wisconsin. p. 65. This page was last edited on 25 October 2009, at 15:08.